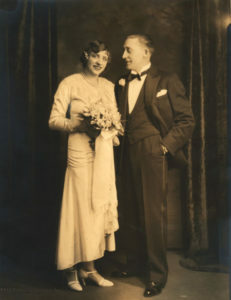 My mother and father’s wedding day, December 24, 1930. Ida Welti and Helge Hjortsberg were both immigrants, she from Switzerland; he from Sweden. They met at a dance in New York City, neither speaking the other’s native tongue. 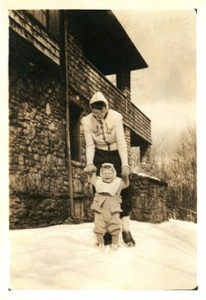 My mother helping me to walk (age one) in front of our house at Roxmor, Woodland Valley, in the Catskill Mountains of New York. We spent all our summers here until I was ten (when my father died.) 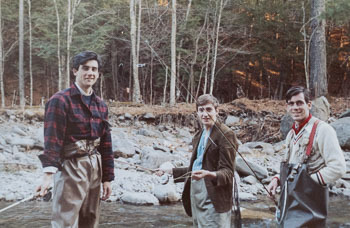 I learned to fish for trout in Woodland Brook and was given my first .22 rifle when I was eight. All my happiest childhood memories are involved with this place. The beautiful shingle-style house, built in the 1910, burnt to the ground in 2001. 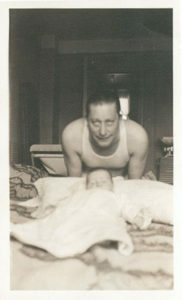 My father with me shortly after I was born on February 23, 1941. 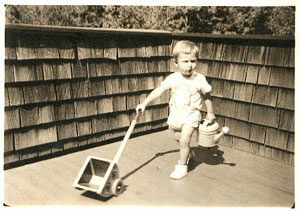 My second summer, strutting my stuff on the upper balcony of the house in Woodland Valley. 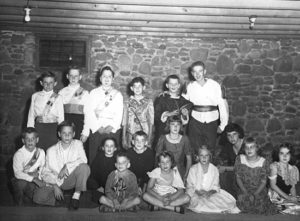 Cast photo of a children’s production of “Cinderella” in the basement of the Roxmor Inn, Woodland Valley, N.Y., summer of 1951. 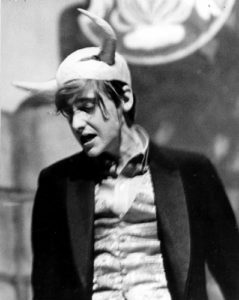 I played the part of the Coachman (remember that pumpkin?) and am standing in the back row (2nd from right.) Next to me, with his hand on my shoulder, is my pal, Fred Muehleck (called “Spinner” in those far-off days.) He played the General. Most of my summertime childhood gang is in this picture: Trudi Miller played Cinderella, Johnny Boyd was Prince Charming, Lar Duggan (without mask) was cast as a dog. 1958. 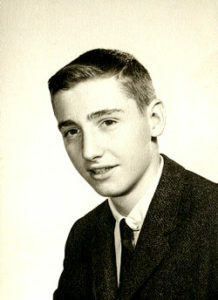 High school graduation photo. 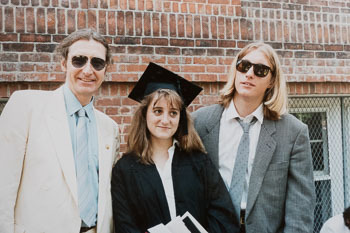 I attended the McBurney School in New York City. 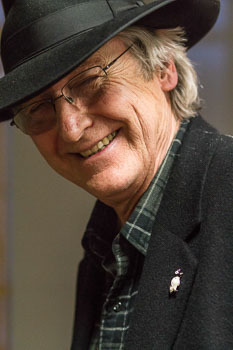 J.D. Salinger also went there and mentioned the school in the beginning of The Catcher in the Rye. After more than seventy years, McBurney filed for bankruptcy a decade ago and vanished without a trace. 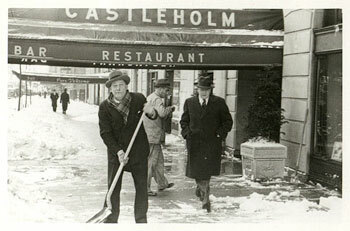 My father posing in front of Castleholm, his restaurant at 344 West 57th Street in New York City. The picture is almost certainly a gag as my father’s preferred work was drinking schnapps with his customers. He usually left snow shoveling to others. 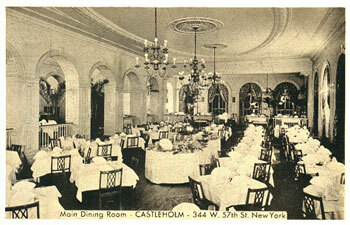 A postcard view of the main dining room at Castleholm, at the time, the finest Swedish restaurant in Manhattan. My father’s restaurant in the Parc Vendome on 57th Street (we lived in an apartment on the eleventh floor) had an outdoor patio with a fountain in the rear where meals were served when the weather was mild and pleasant. While researching my novel, Nevermore, I read a biography of Damon Runyon and discovered that he was also a resident, occupying the penthouse of our building. 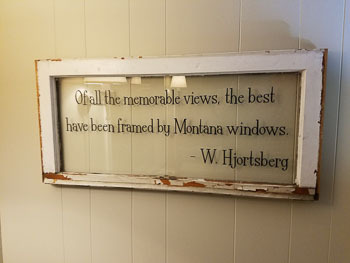 This triggered a Proustian memory. I recalled a story which always made my parents laugh, in itself a rare occurrence. My father delighted in telling about the time one summer morning when he went downstairs to work and discovered all of the restaurant’s garden furniture was missing. Theft was immediately suspected, although there was no sign of any break-in. 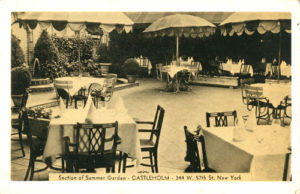 After much investigation, the missing chairs and tables were discovered up on Runyon’s terrace. It turned out that the writer had thrown a big party the night before and didn’t have sufficient furnishings for his guests’ comfort. So he sent a couple of his Broadway cronies (Harry the Horse and Nicely-Nicely Johnson come to mind,) down in the service elevator to “borrow” Castleholm’s garden set-ups. However tenuous the connection, it thrilled me to rediscover the time my family crossed paths with the creator of Guys and Dolls. At Dartmouth, 1961. Photograph by Dana W. Atchley III. Rehearsing the part of Casanova in Tennessee William’s Camino Real, Dartmouth Players, 1961. Michael Moriarity played Kilroy in this production. Photograph by Dana W. Atchley III. 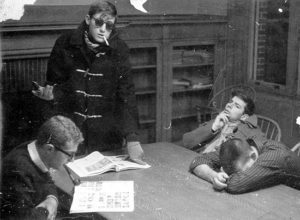 Although this picture was a gag, posed for use in a Jack-o-Lantern parody of the college newspaper, I really looked like this my freshman year. My roomate, Steve Geller, is seated on my left. 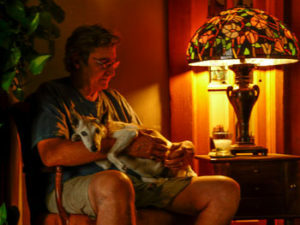 Steve has also had a distinguished career as a novelist and screenwriter. 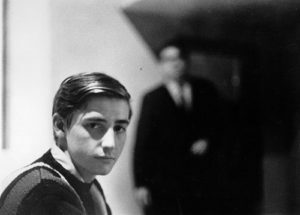 His first book, She Let Him Continue, was filmed as Pretty Poison, with Tuesday Weld and Anthony Perkins. Steve’s best known screenplay was his adaptation of Kurt Vonnegut, Jr.’s Slaughterhouse Five. An eight-pound bonefish. 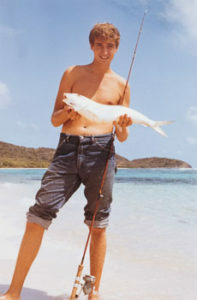 Jack Bay, St. Croix, U.S. Virgin Islands, 1963. At the time, there were no roads to pristine reef-enclosed Jack Bay. Access was by footpath and anyone willing to walk usually had the place to himself. Today, luxury hotels and condos line the shore. 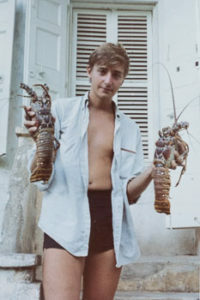 St. Croix, Virgin Islands, 1964. In the kitchen of the house at Jolly Hill. This served as my workroom. I’m writing my first (never-published) novel, Sometimes Horses Don’t Come Back. 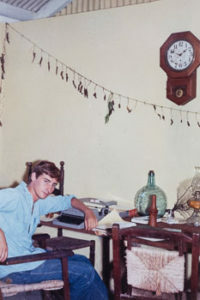 The old Regulator clock came out of an unused one-room Cruzan school. It still works and hangs on the wall of my office today. Frederiksted, St. Croix, Virgin Islands, 1963. A nice pair of spiny lobsters. The south shore near Krause Lagoon, where I dove for lobster and conch, has been largely silted over by dredging for a deep water port to service an oil refinery and aluminum plant in the late sixties. When this picture was taken the island remained unspoiled. Note the ever-present writer’s notebook in my shirt pocket. 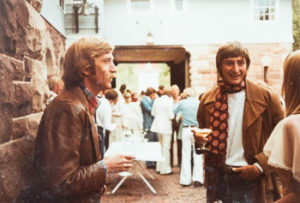 With poet and novelist Dan Gerber at Jimmy Buffett’s wedding in a castle ourtside Aspen, Colorado ca. 1977. 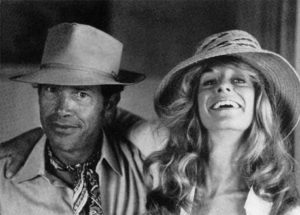 Warren Oates is greatly missed by the Montana Gang. He was a true gentleman and philosopher. 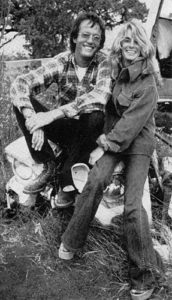 Warren first wandered into Paradise Valley, driving a motor home dubbed the “Roach Coach,” during the filming of Tom McGuane’s Rancho Deluxe. He can be spotted playing harmonica in Jimmy Buffett’s band in the Livingston Saturday Night scene pictured with Becky Fonda. 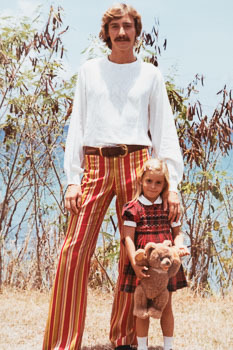 A photo from Peter Fonda’s fine memoir, Don’t Tell Dad. 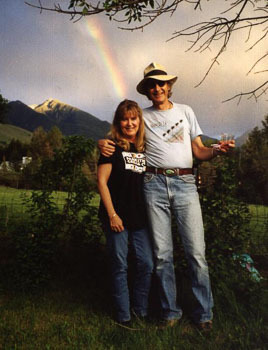 Peter and Becky Fonda are my childrens’ godparents. I’ve known Becky for more than forty years and she is one of the kindest, most generous, biggest-hearted women ever to walk the face of the earth. Peter is my soul-bro. We’re born on the same day (although a year apart) and have been pals since he and Becky got hitched 30 years ago. I wrote the script “Six White Horses” for him and his sister, Jane. It was meant to be As You Like It in the Old West. Unfortunately, the studio fronting the money wanted Bonnie and Clyde in the Depression. The fathers-in-law. 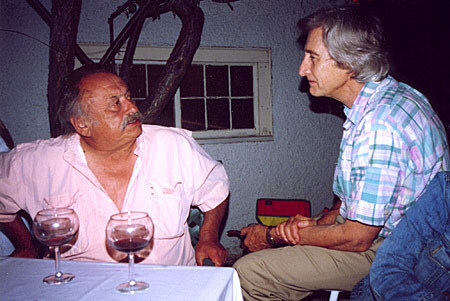 Jim Harrison and yours truly, July 2003. My son eloped with Jim’s daughter the previous summer. Photo courtesy of Toby Thompson. 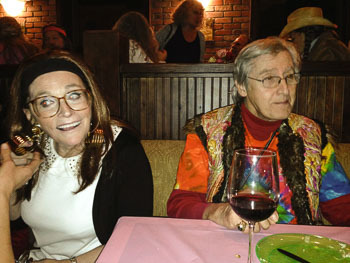 Here is the photo of me at Margot Kidder’s 65th birthday. I’ve known Margie since the mid 70s. (She’s wearing her eyeglasses from 1968.) Hard to believe that I used to dress this way in the sixties and that I actually wore this exact same outfit in 1969 to the offices of Simon & Schuster when they published my first novel, Alp. 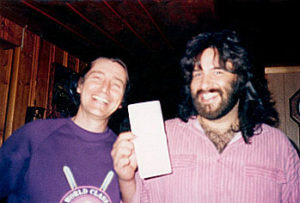 Me and Rob Bottin at the Lion Head Cabin, spring, 1988. The big smiles are for the film ideas written on the piece of paper Rob holds. After a daylong story session, we had come up with several I wanted to write and Rob wanted to direct. Fourteen years later, we’re still smiling and working together. Stripes and plaid ca. 1969 picture of my daughter Lorca, taken by her mother Marian Hjortsberg. Lorca graduating from Vassar College My favorite picture of daughter Lorca, taken when she was a professional dancer. 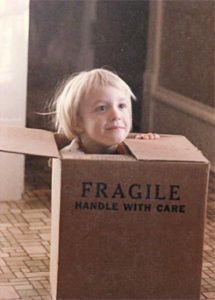 My favorite picture of my son, taken by his mother Marian Hjortsberg when he was three. 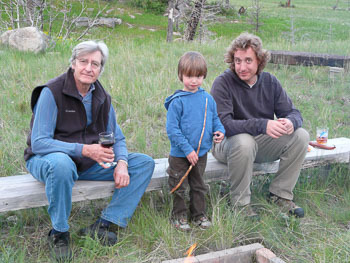 S’mores with my son and grandson Silas at the cabin. 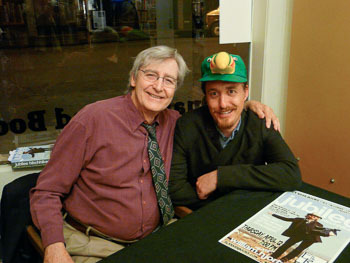 With son Max at a book signing for Jubilee Hitchhiker. 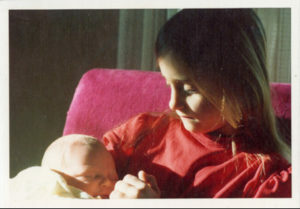 My daughter, Lorca, age seven, holding her week-old brother, Max. 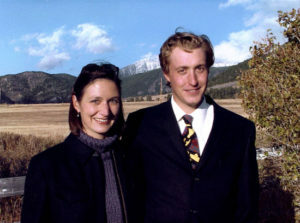 Max and his wife, Anna. Photograph taken in fall 2001 at Doug Peacock and Andrea Barrett’s wedding. My dog, Murphy, a rat-killing-frizbee-catching-ball-chasing s.o.b. Fly fishing with my college fishing buddies. 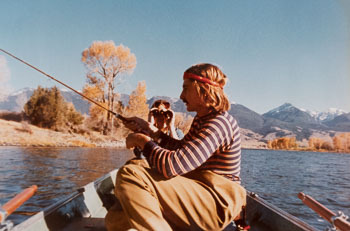 (L-R): Bob Datilla, me and Thomas McGuane Fishing the Yellowstone outside Livingston Montana ca. 1970’s. 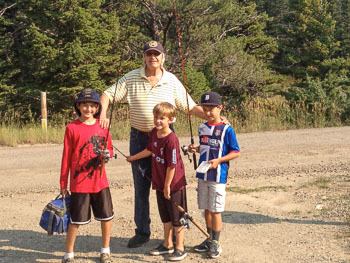 Taking my grandkids out on a fishing adventure on the Boulder River. 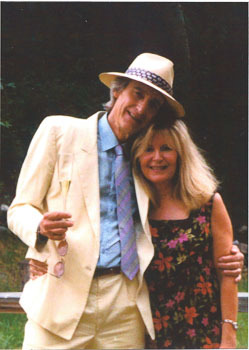 My life partner and wife painter Janie Camp. Getting married to Janie at the cabin 2007. Summer party with wife Janie Camp. 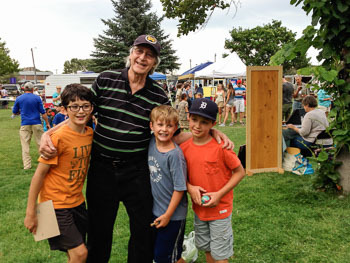 Taking my grandkids out to the Sweet Pea Festival in Bozeman. 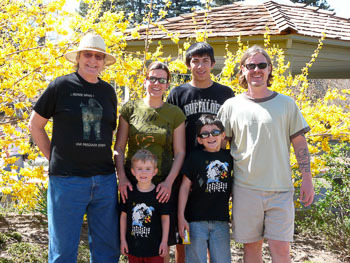 Visting with my stepson Jake Camp and his family. 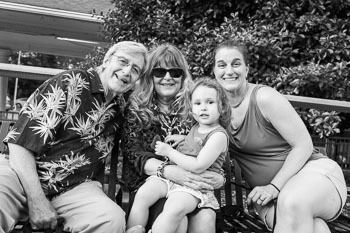 With my wife Janie Camp and her family. 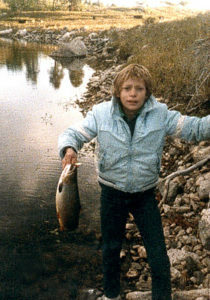 My stepson, Michel, looking a bit awed after catching a three-pound cutthroat during a camping trip to Nurses Lake, just over Baker Draw from my cabin, summer 1985. Today, he is married and lives in New York City, where Michel Leroy is an advertising photographer. 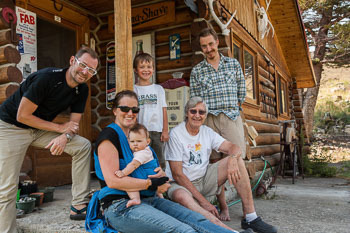 Michel, wife Michelle and six month old daughter Vivian along with my son Max and his son Silas after a hot summer hike up at the cabin. 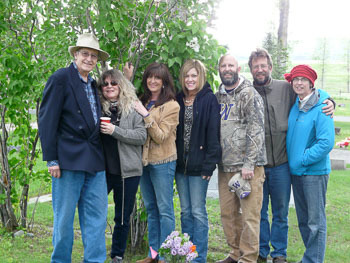 Janie and I visiting Michel and his family at their home in New York for the book launch of Mañana. Lars Hjortsberg (1772-1843). My great-great grandfather had a long dramatic and musical career in Stockholm, first appearing at the Operan at age ten and also performing many times at the Dramaten. He was an early sponsor of Jenny Lind (“the Swedish Nightingale”) and his son, Max, became her secretary. 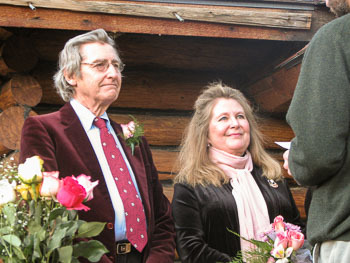 Lars had seventeen children in all and died with a smile on his face while tending his rose garden at age seventy-one. 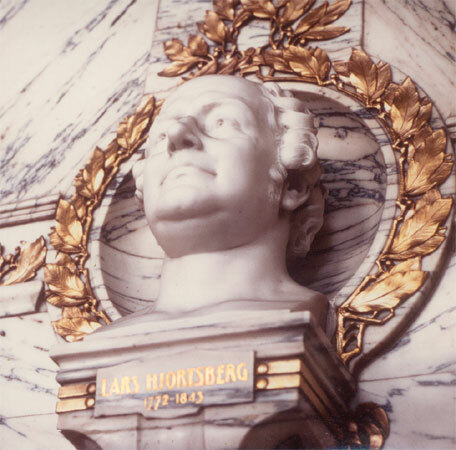 The snapshot is of a marble bust of Lars Hjortsberg in the Dramaten in Stockholm. Photo courtesy of James T. Byrne. -William Hjortsberg With my sprit animal, the penguin, on the lapel and a black fedora, my signature look, I head out to my next adventure.